When the Twins signed Phil Hughes to a three-year, $24 million contract this offseason the idea was that getting him away from homer-inflating Yankee Stadium would fix his biggest problem of serving up long balls. That's played out exactly as hoped, with Hughes allowing just nine homers in 122 first-half innings after averaging 19 homers per 122 innings from 2010-2013. Beyond that there was also another big but unexpected change: He stopped walking anyone. Hughes has always had mediocre control, averaging nearly 3.0 walks per nine innings for his Yankees career, but this season under Rick Anderson's coaching his walk rate is a miniscule 0.8 per nine innings. Not only is that the second-lowest rate in all of baseball--sandwiched between Hisashi Iwakuma and Clayton Kershaw--it's the second-lowest walk rate in Twins history behind only Carlos Silva's ridiculous 0.4 per nine innings in 2004. Hughes' velocity and strikeout rate remain nearly identical to his Yankees days and he's still one of MLB's most extreme fly-ball pitchers, but switching home ballparks has made those fly balls less of a weakness and refusing to walk anyone has turned him into a different pitcher. He walked zero or one batter in 17 of 19 first-half starts (89 percent) after doing so in 61 of 132 starts (46 percent) for the Yankees. He's been a souped-up version of the Twins' long-preferred pitching mold. Kevin Correia got off to a horrendous start, put together a nice stretch heading into the All-Star break, and just like last year finished the first half as one of baseball's worst starters. Offensive levels dropping across MLB have kept his numbers from being as gag-inducing as bad pitchers from 5-10 years ago, but among the 93 qualified starters this season Correia ranks dead last in strikeout rate, second-to-last in xFIP, and 84th in ERA. He also leads MLB with 11 losses. Signed to a four-year, $49 million deal this offseason to front the Twins' rotation, Ricky Nolasco was the worst starter in the league for three months and then revealed that he'd been pitching through an elbow injury since spring training. Within his terrible performance was some poor luck on balls in play, even by Nolasco's often "unlucky" standards, but his velocity, strikeout rate, and walk rate were also all worse than the 31-year-old's career norms. Based on secondary numbers Nolasco performed more like a 4.50 ERA pitcher than a 5.90 ERA pitcher, but that's still awful in a year when the average starter has a 4.05 ERA. Justin Morneau hit .321/.375/.559 in his MVP-winning 2006 season. This year opponents have hit .330/.368/.538 off Nolasco. Thankfully for the Twins adding Hughes to the rotation has worked out well, because the decisions to sign Nolasco and re-sign Mike Pelfrey have gone about as poorly as possible. Kyle Gibson returned from Tommy John elbow surgery without bat-missing raw stuff, generating just 4.7 strikeouts per nine innings since going under the knife. That limits his upside and means he'll always be in danger of a rapid collapse, but his ability to induce grounders has remained with the rebuilt elbow and his ground-ball rate of 54.6 percent ranks seventh among all MLB starters. And after some early control problems he issued just nine walks in his final 10 first-half starts. Throwing strikes and keeping the ball on the ground is a recipe for success, but without strikeouts that success likely tops out in the middle of the rotation. Which is fine, of course. The last Twins starter to log 150 innings with a higher ground-ball rate than Gibson's current mark was ... no one, at least not since 2002 when the data begins. Still, fewer than 5.0 strikeouts per nine innings is Silva, Nick Blackburn, and Scott Diamond territory, which is a dangerous place to be. Once presumed to be a member of the rotation, Sam Deduno began the season in the bullpen before shifting into starter mode to replace the injured Pelfrey in May. After an ugly June 14 start he moved back to the bullpen, where he finished the first half by throwing 13 scoreless innings. His sample size of relief work is too small to draw any conclusions, but with a 4.51 ERA and 4.5 walks per nine innings in 41 career starts there's no need to see more of Deduno in the rotation. Nearly all of the gains Anthony Swarzak made last season have vanished this year, as his strikeout and walk rates have regressed to the pre-2013 levels that made him look like a marginal big leaguer. His durability has value in a bullpen-saving role, but Swarzak is now 28 years old with a 3.69 ERA and just 5.8 strikeouts per nine innings in 132 career relief appearances. He doesn't miss enough bats or throw enough strikes. I'm not sure people fully appreciate just how good Glen Perkins has been since moving to the bullpen full time in 2011. During that four-year span he's posted a 2.54 ERA in 235 appearances, compiling 269 strikeouts compared to 49 non-intentional walks in 234 innings. And since taking over for Matt Capps as closer in mid-2012 he's converted 74 saves at an 89 percent success rate. By comparison, Mariano Rivera converted 89 percent of his career save chances. Among all MLB relievers with at least 200 innings since 2011 he ranks seventh in strikeout-to-walk ratio, eighth in average fastball velocity, and ninth in Win Probability Added and xFIP. He's been one of the 10 best relievers in baseball since becoming a reliever and Perkins is actually getting better, as this year's 49/7 K/BB ratio in 39 innings represents the best strikeout and walk rates of his career. He's the third-best reliever in Twins history behind Joe Nathan and Rick Aguilera. It'd be easy to point to his 3.34 ERA in 35 appearances since back-to-back ugly April outings as proof that Jared Burton has been his old self of late, but the truth is that a 3.34 ERA isn't even much better than this season's MLB average of 3.60 for relievers and his 24/10 K/BB ratio in 32 innings during that span is hardly vintage Burton. His velocity and strikeouts are down, his walks and fly-ball rate are up, and after a helluva run for the Twins he's in decline mode at age 33. Extreme fly-ball pitchers always make for tricky late-inning relievers and Casey Fien has had a few home run-based blowups, but he's also got a 2.95 ERA and fantastic 137/27 K/BB ratio in 137 innings since the Twins signed him as a minor-league free agent in 2012 and then called him up with zero expectations that July. During that three-year span Fien has been superior to Burton in strikeout rate, walk rate, opponents' average, ERA, and xFIP. He's the Twins' best setup man. Compared to last season his ERA looks much better, but Brian Duensing's secondary numbers are actually much worse and in particular he's managed a poor 21/13 K/BB ratio in 36 innings. Duensing continues to be decent versus left-handed hitters, but he's walked more righties (10) than he's struck out (9). For his career righties have hit .297/.356/.462 off Duensing and he's not nearly dominant enough against lefties to make up for it. Pelfrey was terrible in 2013, going 5-13 with a 5.19 ERA in 29 starts, but for some reason the Twins felt compelled to give him a two-year, $11 million contract. He went 0-3 with a 7.99 ERA in five starts, got shut down with a dubious groin injury, and later underwent elbow surgery. He's probably done for the season, but Pelfrey will be back in the mix for a rotation spot next season because he's still owed another $5.5 million. Last season Caleb Thielbar came out of nowhere to emerge as the Twins' secondary left-handed setup man and he's filled the same role relatively well this year. At age 27 the former independent leaguer lacks long-term upside, but through 76 innings as a big leaguer he's got a 2.23 ERA and 60/22 K/BB ratio without extreme platoon splits. He's been used in low-leverage situations, but that could change in the second half if the Twins start auditioning him for Duensing's gig. Signed to a minor-league deal and then promoted to Minnesota one day before the mid-May opt-out clause in his contract, Matt Guerrier has posted a nice-looking 2.67 ERA with just one homer allowed in 20 appearances. He hasn't quite been his old self, however, with just 12 strikeouts in 27 innings and an average fastball velocity of 89 miles per hour. At age 35 he's a low-leverage reliever, which is exactly how the Twins have used the former setup man. Signed to a two-year, $10 million contract that didn't make much sense this offseason, Kevin Correia posted a 2.23 ERA in April that had people coming up with all sorts of theories about why he'd turned a corner at age 32. Since the calendar flipped to May he's made 15 starts with a 5.21 ERA, allowing opponents to hit .321 with 15 homers in 74 innings. Since completing at least seven innings in each of his five April starts Correia has done so just once in his last 15 outings. Overall he has a 4.23 ERA compared to the AL average of 4.08 and across baseball Correia ranks 85th among 89 qualified starters in both strikeout rate and swinging strike percentage, which is some serious pitching to contact. He's been slightly less ineffective than expected thanks to the fast start, but Correia has shown why the multi-year commitment was misguided and if the Twins can trade him before the ERA rises any further they should. Scott Diamond's miniscule strikeout rate suggested that last year's success would be short-lived and sure enough he unraveled in the first half. His strikeout rate fell even further to 4.2 per nine innings, which is the worst in baseball, and his walk and ground-ball rates declined from excellent to merely good. Toss in a 30-point uptick in Diamond's batting average on balls in play and you end up with an ERA that jumps from 3.54 to 5.32. Diamond wasn't as good as he looked last season and isn't as bad as he's looked this season, but overall he's a whole lot closer to a left-handed Nick Blackburn than a long-term building block. In fact, through three seasons the comparison between Diamond and Blackburn is eerily close. Diamond has a 4.27 ERA and rates of 4.5 strikeouts, 2.1 walks, and 1.0 homers per nine innings. Blackburn had a 4.14 ERA and rates of 4.4 strikeouts, 1.8 walks, and 1.1 homers per nine innings. All the offseason and early spring training talk of Mike Pelfrey being vastly ahead of schedule in his recovery from Tommy John elbow surgery gave way to his actually having to pitch and it was ugly. Pelfrey had a 6.66 ERA through 11 starts, including a .332 opponents' batting average and 26-to-19 strikeout-to-walk ratio in 51 innings. He then likely saved his rotation spot with a decent five-start stretch to finish the first half, with a two-week disabled list stint mixed in. Pelfrey wasn't particularly effective before the surgery, serving mostly as an innings-eater for the Mets, and going under the knife didn't fix his inability to miss bats. He relies almost exclusively on a low-90s fastball, which is why Pelfrey is averaging fewer than 6.0 strikeouts per nine innings for the eighth time in eight seasons. That pitch used to at least generate lots of ground balls, but his current rate of 43.8 percent is a career-low and actually qualifies Pelfrey as a fly-ball pitcher. Last season Samuel Deduno was relatively successful with a 4.44 ERA in 15 starts despite nearly as many walks (57) as strikeouts (53) in 79 innings. Even that modest success won't work long term with those secondary numbers and somewhere along the way pitching coach Rick Anderson appears to have hammered that point home to Deduno. Prior to this year Deduno had walk rates of 6.1 per nine innings in the majors and 5.0 per nine innings at Triple-A. This year he's at 2.9. It's a sample size of 10 starts, but Deduno has three or fewer walks in all 10 of them after doing so just half the time last year. His strikeout rate has actually fallen to 4.5 per nine innings, which is among MLB's worst, but he's made up for the lack of missed bats by nibbling less and letting the movement of his pitches induce an AL-high 61 percent ground balls. Or, put another way: Pitching to contact actually works for Deduno. There's more reason to believe in him now than last year. After three sub par years split between the rotation and bullpen Anthony Swarzak has taken a step forward as full-time long reliever. Compared to his first three seasons Swarzak has upped his strikeouts by 28 percent, reduced his walks by 26 percent, and become less fly-ball prone. He's been one of the most effective pitchers on the entire staff, although that's admittedly not saying much and because most of his work comes in long-relief spots his impact has been minimal. In fact, the Twins are 6-21 when Swarzak pitches. That should be blamed on his role rather than his performance, which includes a 3.55 ERA and 41-to-12 strikeout-to-walk ratio in 58 innings. So far they've resisted the urge to put Swarzak back into the rotation and they've also yet to really move him up the bullpen hierarchy. Considering the overall state of the pitching staff if Swarzak keeps pitching this well in the second half he'd warrant some kind of higher-leverage gig. When the Twins acquired 25-year-old Vance Worley from the Phillies in the Ben Revere trade he was supposed to step in as a long-term mid-rotation starter. Worley had thrown 278 innings with a 3.50 ERA for the Phillies and while there were questions about his many called strikeouts being sustainable there was little reason to expect a collapse. And then he went from Opening Day starter to Triple-A in less than two months, allowing 43 runs in 49 innings. He generated just 15 strikeouts in 10 starts, got a swinging strike on an abysmal 4.5 percent of his pitches, and allowed a .381 opponents' batting average. Worley has been much better since the demotion to Rochester, but it's hard to be very encouraged by a 3.88 ERA at Triple-A when it comes with 34 strikeouts in 58 innings. He'll be back with the Twins at some point, but Worley hasn't been right since last year's elbow issues and was never a high-upside arm to begin with. As far as Rule 5 picks go Ryan Pressly has been a big success. Used mostly for mopping up and long relief, he threw 44 innings with a 3.09 ERA and averaged 93 miles per hour with his fastball. Far less impressive than the shiny ERA is a 30-to-17 strikeout-to-walk ratio and Pressly is unlikely to be as stingy with homers going forward considering his high fly-ball rate, but he's been a useful member of the bullpen and has definitely shown some long-term upside. Jared Burton picked up right where he left off following a fantastic 2012 season with a 2.10 ERA and 26 strikeouts in 26 innings through the end of May. Then he went through a rough patch while dealing with a groin injury, allowing 12 runs in 10 appearances as his ERA ballooned to 4.29 and he was removed from setup duties. Burton recovered to end the first half with six shutout outings in a row, although his usual swing-and-miss stuff still wasn't there. Last year's .220 batting average on balls in play was always unsustainable and his overall stats remain decent with a 3.67 ERA and 36 strikeouts in 42 innings, but Burton has already walked more batters than all of last year and both his velocity and swinging strike rate are down slightly. Hopefully it's just a blip on the radar, because a healthy Burton can be light outs and he's signed through 2015 at salaries that make him a reasonably priced setup man or good trade bait. For the second time in two seasons the Twins called up P.J. Walters when their rotation was a mess, got a handful of decent outings from him before things fell apart, and then passed him through waivers unclaimed to keep the 28-year-old right-hander in the organization as Triple-A depth. Meanwhile, he has a 5.79 ERA in 20 starts for the Twins after posting a 4.60 ERA in 133 starts at Triple-A, making Walters the epitome of a replacement-level starter. Acquired from the White Sox in the Francisco Liriano trade, Pedro Hernandez is a soft-tossing, strike-throwing lefty who struggled against right-handed hitters in the minors and not surprisingly big-league righties have crushed him to the tune of .353/.423/.639 with eight homers in 137 plate appearances. He had two first-half stints with the Twins as a rotation fill-in, posting a 6.17 ERA in seven starts, and it's tough to see Hernandez having long-term success as a starter. When the Twins claimed Josh Roenicke off waivers in November the story of his career was a big fastball and not much else, including a modest strikeout rate and poor control. His average fastball dipped to 91.2 miles per hour in the first half, but the rest of the story stayed the same with an awful 25-to-21 strikeout-to-walk ratio in 38 innings. And after some initial success he gave up 14 runs in his final 24 innings with as many walks (15) as strikeouts (15). Brian Duensing flopped as a starter, but has yet to rediscover his previous success as a reliever. Slated to be the primary left-handed setup man, Duensing struggled against lefties and righties while posting a 4.67 ERA and 30-to-16 strikeout-to-walk ratio in 35 innings and spent the final month or so of the first half working mostly in a mop-up role. His inability to handle righties will forever limit Duensing, but the good news is that his trouble with lefties looks like a fluke. Lefties hit .307 off Duensing in the first half, but that was due to a ridiculously high .408 batting average on balls in play. Delving a little deeper, he posted a great 20-to-5 strikeout-to-walk ratio versus lefties and held them to just one homer in 82 plate appearances. Despite the rough first half not much has really changed with Duensing, but unfortunately that just means he's still a decent middle reliever who's a bad bet facing righties and a good bet facing lefties. Burton and Duensing struggling as the main setup men pushed Casey Fien into a more prominent late-inning role and he responded by continuing to thrive. 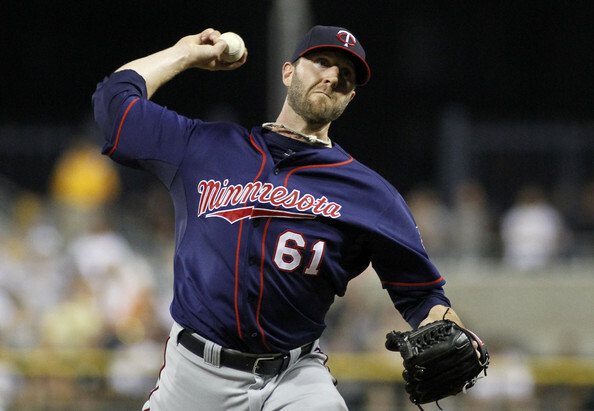 Not only did he have a 3.03 ERA and 42-to-7 strikeout-to-walk ratio in 39 first-half innings, dating back to his debut with the Twins last season Fien has a 2.57 ERA and 74-to-16 strikeout-to-walk ratio in 74 frames. Not bad for a guy who joined the Twins as a minor-league free agent last offseason at age 28. He's probably due to come back down to earth at least a little bit and if that does happen it'll likely stem from serving up too many homers, as Fien was an extreme fly-ball pitcher in the minors and has one of the 10 lowest ground-ball rates in the majors since last season. However, his overall track record in the minors showed someone capable of being a quality middle reliever and so far he's allowed just seven homers in 287 plate appearances. Glen Perkins' first full season as the Twins' closer has been an overwhelming success except for the part about the team failing to find him consistent work. Perkins converted 21 of 23 saves with a 1.82 ERA and 47-to-7 strikeout-to-walk ratio in 34.2 innings, holding opponents to a .172 batting average. 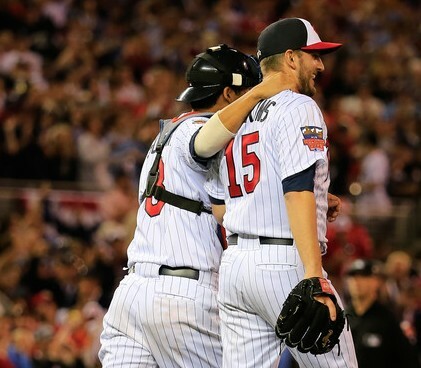 That's about as dominant as a pitcher can be and Perkins was rewarded with his first All-Star selection, yet the Twins used their All-Star closer for just 131 batters in 92 games. Some of that stems from their lack of late leads, but Ron Gardenhire's refusal to use Perkins in non-save situations is the real culprit. Not only have 100 different relievers thrown more innings than Perkins, six Twins relievers have worked more. It's gotten so bad that Perkins requested more action, but Gardenhire continues to manage the bullpen around the save statistic while calling on lesser relievers in game-changing spots. Perkins is great, but his usage is terrible. In his first full season back from Tommy John surgery Kyle Gibson entered spring training in the mix for a rotation spot, but pitched his way out of the immediate plans and then the Twins decided to keep him at Triple-A for three months. He was one of the International League's best pitchers, posting a 3.01 ERA with tons of ground balls and a 79-to-28 strikeout-to-walk ratio in 93 innings, and after going through eight other starters the Twins finally called him up three weeks ago. Gibson had a very nice debut followed by three mostly poor outings, but looking beyond the ugly 6.45 ERA he induced 51 percent ground balls, generated a decent number of swinging strikes, and averaged 92.3 miles per hour with his fastball. Ultimately the key for Gibson is whether he can get enough strikeouts to be more than a mid-rotation starter who throws strikes and kills worms. At this point the jury is still very much out and his second-half workload may be limited. Twenty straight scoreless innings is an amazing start to anyone's career, let alone a 26-year-old rookie signed out of independent ball in 2011. Caleb Thielbar turned what looked likely to be a short-term call-up into a two-month gig, and while his secondary numbers and inherited runners allowed paint a much less impressive picture than his sparkling ERA he's shown more than enough to stick around with 21 strikeouts in 21 innings and 11 percent swinging strikes. 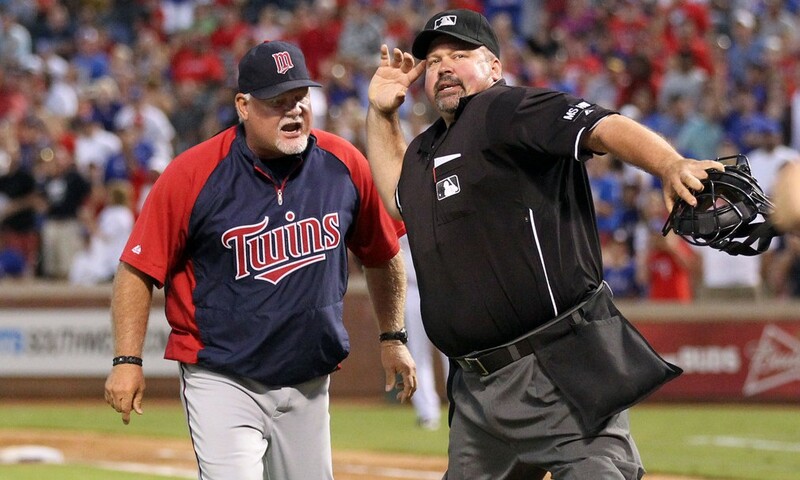 Note: For a similar first-half review of the Twins' hitters, click here. Four of the eight managers who kept their jobs after three consecutive 90-loss seasons were from expansion teams, so tons of losing was expected/accepted. And five of the eight managers who stuck around after three straight 90-loss seasons were fired by the middle of the next year. Kelly managed the Twins to four 90-loss seasons in a row from 1997-2000 and then went 85-77 in 2001, at which point he stepped down from the job at age 50 and was replaced by Gardenhire. • After a solid debut Kyle Gibson has struggled in back-to-back starts, leaving him with a 7.27 ERA and 10-to-5 strikeout-to-walk ratio in 17 innings. Among all pitchers in Twins history through three career starts Gibson allowed the most hits (23) and second-most earned runs (14). LaTroy Hawkins is the only Twins pitcher to allow more earned runs in his first three starts and he's had a 19-year career, although all of his success came after shifting to the bullpen. It's silly to analyze three starts too much, but Gibson has been done in by a .377 batting average on balls in play and nearly half the runners he's put on base coming around to score. Fortunately neither of those rates are sustainable and the good news is that he's averaged 92.5 miles per hour with his fastball while inducing 54 percent ground balls and has yet to allow a homer. And despite a modest strikeout total his swinging strike percentage is slightly above average. • Caleb Thielbar going on bereavement leave means Michael Tonkin will be getting his first taste of the majors at age 23. Early on Tonkin's biggest claim to fame was being Jason Kubel's brother-in-law, but since shifting to the bullpen in 2011 the 6-foot-7 right-hander has emerged as a high-upside reliever with dominant numbers to match his mid-90s fastball. Dating back to last season Tonkin has a 2.17 ERA and 143 strikeouts in 99 innings. That includes a 1.85 ERA with zero homers allowed and a 46-to-11 strikeout-to-walk ratio in 39 innings between Double-A and Triple-A this year, so if Tonkin makes a good first impression the Twins may decide to keep him around at the expense of someone else in the bullpen. Either way, Tonkin is one of the most promising reliever prospects the Twins have had in a long time and it's easy to imagine him setting up for Glen Perkins at some point next season. • As a follow-up to Perkins encouraging the Twins to use him more often in non-save situations, just 40 percent of his batters faced this season have come in "high leverage" situations compared to 43 percent in "low leverage" situations. 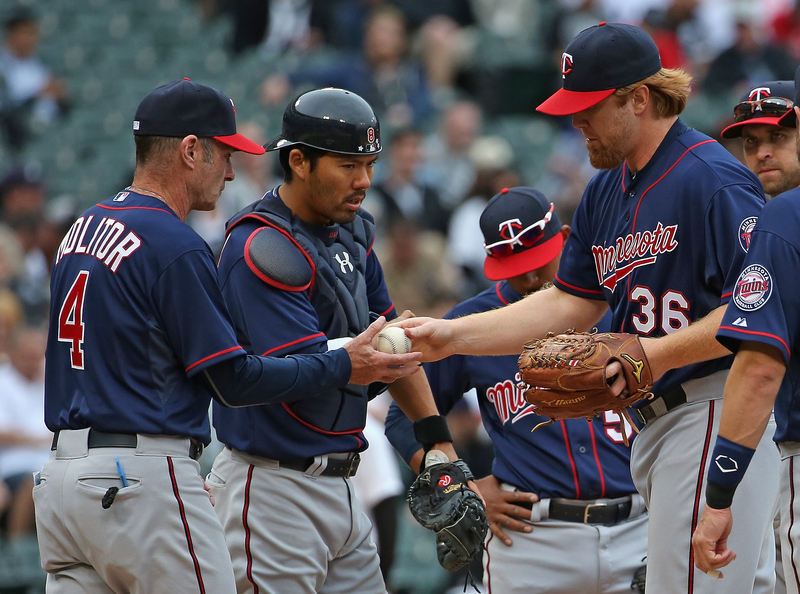 By holding him back for save situations that often never materialize the Twins limit Perkins' overall workload, forcing lesser relievers into crucial spots, and end up using him in unimportant spots just to keep him from getting rusty. But apparently they haven't started listening to Perkins yet. Last night the Twins lost a 13-inning game to the Rays in which they used six different relievers, but not their All-Star closer. Rule 5 pick Ryan Pressly, who's served as a mop-up man for most of the season, took the loss while Perkins went unused because it wasn't a so-called "save situation." Of the seven relievers who've been with the Twins all season Perkins has thrown the fewest innings. Saves are a helluva drug. • Justin Morneau has finally started to show a little power with four homers in 11 games after totaling six homers in his previous 115 games dating back to last year, but his overall production hasn't improved. It's hard to imagine there being much of a trade market for the impending free agent, but getting a compensatory draft pick if he signs elsewhere this winter is also no longer really an option for the Twins because he'd probably just accept the $15 million qualifying offer. It's possible that Morneau would be willing to take a major pay cut to remain in Minnesota beyond this season, but do the Twins really want to block various young, cheap hitters with a 32-year-old first baseman who's hit just .259 with a .321 on-base percentage and .405 slugging percentage in 285 games since 2011? That's a harsh reality considering his decline began with a concussion, but even at half of his current $14 million salary Morneau just doesn't make much sense to retain. • If the Twins do trade Morneau before he walks as a free agent Chris Colabello deserves a long look in his place. After a so-so season at Double-A last year Colabello has crushed Triple-A this season, hitting .357/.435/.656 with 23 homers, 22 doubles, and 41 walks in 81 games. Colabello is 29 years old and was signed out of an independent league, so he's hardly a top prospect, but he leads the International League in batting average, slugging percentage, OPS, and homers. Maybe that won't translate to the big leagues, but one of the only benefits to being a bad team is that the Twins are in a position to find out. At worst Colabello struggles and gets written off as a Triple-A player as the Twins continue their march toward another 90-loss season, but he might also prove to be a decent stop-gap first baseman while making just $500,000. And if nothing else he'd give them a right-handed bat to help balance a very left-handed lineup. • Josh Willingham limped around on a bum knee for a month before finally being placed on the disabled list amid reports that he planned to avoid surgery and return after the minimum 15 days. Instead literally the next day it was announced that he'd undergo surgery and miss 4-6 weeks, which is definitely on the optimistic side for a torn meniscus. And sadly all of that has become a pretty standard injury progression for the Twins during the past three seasons. Willingham hit just .250/.337/.325 in June with even worse defense than usual, making him one of the worst all-around players in baseball. Allowing him to play at what was clearly less than full strength hurt the team, hurt Willingham, and now leaves the Twins with little chance to trade him. We may never know what they could have gotten in exchange for him last July or this offseason, but as someone who implored the Twins to shop Willingham around it's a question that looms. • Aaron Hicks' season totals still look awful, but that's what happens when you start 2-for-48. Since then he's hit .249/.301/.462 with seven homers in 50 games, which is actually pretty damn impressive for a 23-year-old center fielder. He continues to strike out a ton and Hicks has stopped walking, but here's a list of all the 23-year-old center fielders to slug .450 or higher in the last 10 years: Colby Rasmus, Adam Jones, Matt Kemp, Chris Young, Grady Sizemore. I still think it was a mistake to hand Hicks the Opening Day job without any experience at Triple-A and it's a shame that he's going to burn through an entire season of service time when that wasn't necessary, but that shouldn't take away from the fact that he's turned things around following one of the most brutal starts to a career you'll ever see. Even his defense has graded out much better recently and he's done some nice work as a baserunner. • P.J. Walters is a 28-year-old with a 6.28 ERA in the big leagues and a 4.45 ERA at Triple-A, so he predictably passed through waivers unclaimed after being designated for assignment to make room for Gibson's arrival and Mike Pelfrey's return. Walters accepted the assignment, so he'll stay with the Twins at Triple-A while no longer being on the 40-man roster. This is the second time in two years none of the other 29 teams claimed Walters off waivers. • Since being called up from Triple-A in July of last year Casey Fien has thrown 71 innings with a 2.67 ERA and 71-to-16 strikeout-to-walk ratio while holding opponents to a .187 batting average. Last offseason the Twins signed Fien to a minor-league deal and based on his track record in the minors he looked like a potentially useful middle reliever, but the 29-year-old right-hander been a whole lot more than that so far. 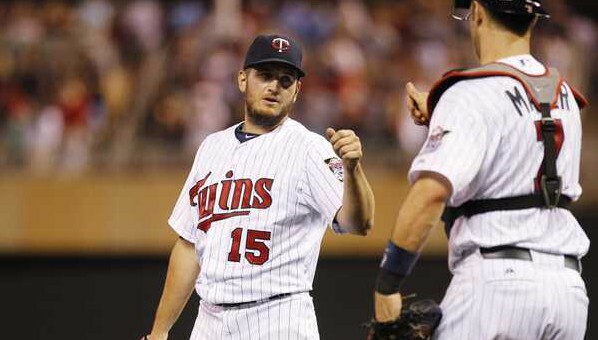 • After last night's loss the Twins are 37-51, which puts them on pace to go 68-94. At this same point in the season they were 36-52 in 2012 and 40-48 in 2011, so not much has changed. • Brian Dozier since June 1: .264/.386/.500 with six homers, eight doubles and as many walks (19) as strikeouts (19) in 35 games. Six weeks are six weeks, but it's a sign of life. • Twins Daily blogger and "Gleeman and The Geek" regular Parker Hageman wrote a good guest column for Baseball Prospectus about how the Twins develop their prospects. • For a lot more about Willingham's injury situation, Walters' exit, Dozier's nice run, and the many former Twins on the All-Star team check out this week's "Gleeman and The Geek" episode.